Figures for 2016 leave no room for doubt – foreign direct investment in Brazil is on a high. Investment in December reached the highest ever for this month of the year and 2016 finished with an increase of 6 per cent. 2017 looks set for more of the same as multinationals confirm that Brazil “is too big to ignore”. An article titled “Business bets on Brazil economic rally” published in early February by the Financial Times gives some examples of the large foreign direct investment (FDI) currently taking place in Brazil. 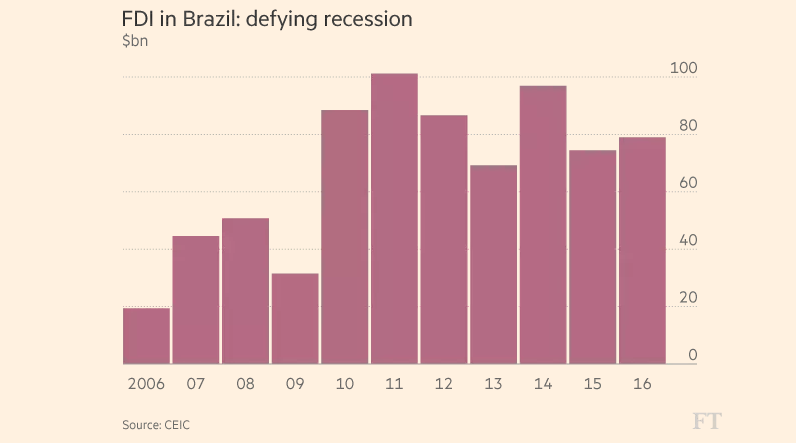 The article also points out reasons why businesses are betting on Brazil this year. “Last year was very big for FDI,” says David Beker, an economist at Merrill Lynch, in the article. And the figures for foreign direct investment in Brazil last year emphasise his statement. In December, FDI reached US$15.4 billion, a record figure for this month in the year. This end-of-year boom reflected a general trend throughout the year and 2016 ended with a total of US$78.9 billion. This represents a 6 per cent increase in FDI in Brazil on 2015. FDI in Brazil reaped rich returns last year when the Ibovespa stock market rose by 38.9 per cent. In dollar terms, returns exceeded 60% making the Brazilian stock market (excluding dividends) the best-performing emerging market in the world. Also in dollar terms, the market value of the stock exchange was the highest in Latin America – its value rose by 57% in 2016 to reach US$717.14 billion. This rise in investment indicates investor confidence in Brazil despite the country’s economic difficulties last year. Hanno Kirner, executive director of strategy at Jaguar Land Rover, claims that this is because Brazil “has got everything in the long term”. Quoted at length in the Financial Times article, Kirner says that “Brazil is a strong economy. It has resources, it has a young dynamic population”. These pillars behind the Brazilian economy are the basis for long-term investor confidence and one of the reasons why foreign direct investment in Brazil was so strong last year. All signs point to further big foreign direct investment in Brazil this year. According to the Financial Times, Jaguar Land Rover is “ramping up a new £240 million factory it opened in Rio de Janeiro state last year”. And State Grid, a Chinese electricity company, has invested R$17.4 billion to take control of CPFL Energia in Brazil. These big-ticket investments join others such as the US$2.2 billion by the French oil company TOTAL in Petrobras. The same company reportedly plans to invest US$1 billion a year in Brazil from this year onwards. Royal Dutch Shell are investing US$10 billion in oil production by 2021. Get involved in foreign direct investment in Brazil from just US$30,122.